Two troop leaders are required and admitted free and there is a minimum of eight scouts required per program. Programs are 1.5 hrs. All programs are led by screened and certified counselors. Scout Awards are not supplied by the Museum. Due to space and program content, siblings are not able to be included in sessions. 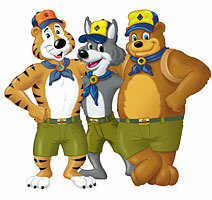 Want to learn more about the Cub Scout programs? Please use the form below. To make a reservation, please call (516) 572-4066 (M-F, 10-4). Explore space in our very own Jet Blue Sky Theater Planetarium. Enjoy the wonders in the night sky and create your own constellation to take home. Learn about astronauts who travelled through space! Did you know that many astronauts were scouts?! $16.00 per Scout. The purpose of this adventure is simple, to make it move! Scouts will learn all about how simple machines were used for centuries to make work easier. After taking what they have learned about simple machines, scouts will be introduced to the term “chain reaction” and be challenged to create a Rube Goldberg Machine to accomplish the simplest task in the most complicated of ways. $12.00 per Scout. Robotics is the way of the future! Or is it? Scouts will learn how robots are currently used throughout our daily lives and what role robots may play in our future. To help scouts get a head start for this future of robotics they will learn the characteristics of robots, create a robotic hand, and construct their own cardboard robot! $12.00 per Scout. It’s no secret - codes are fun to use! In this adventure scouts will explore math related activities, while actually doing math! Scouts will create a homemade game that requires math to keep score, build a rain gauge, and decode a secret message. For the rain gauge, scouts are kindly asked to supply their own empty 2-liter bottle. $12.00 per Scout. What do skyscrapers, bridges, cars, airplanes, and spaceships have in common? They were all engineered! During the program, scouts will be introduced to the different engineering professions and then acts as engineers! They will discover the importance of the engineering design process, from idea to blueprint, engineer a system capable of a Moon landing, and assemble their own wood model! $16.00 per Scout. Want to learn more about the Cub Scout programs? Please use the form below or to make a reservation, call 516-572-4066 (M-F, 10-4).